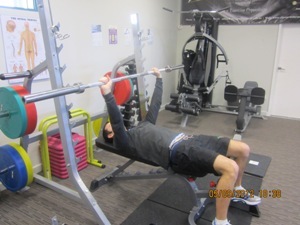 The chest muscles must perform exhaustive movements on a daily basis and so correctly fine tuning their movement patterns and performance greatly reduces the overtraining risks associated with bench press and a whole host of other “pushing away” movements. As we use the chest so often in gym, sports and daily activities it is a common area of injury around the front of the shoulder. Personal trainers from Peak Body can show you how to get the most out of a chest workout with minimal effort and low risk of injury. Step 1- Lay on the bench with your feet flat on the ground and position your hands with an overhand grip at shoulder width. 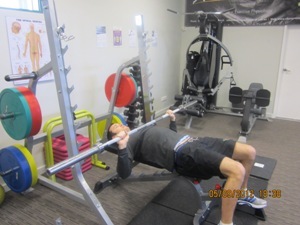 Step 2- Bring the bar down slowly until it’s just above the chest. Make sure to breathe in during this phase of the movement and then breathe out when pushing the bar back to the starting position.